We’re gonna need a bigger snowblower! Winter Storm Stella looms on the horizon. This could be the big one. While most of the Northeast thinks winter is over, they are in for a big surprise this week. Even though the nation’s capital was enjoying 80-degree weather just a few weeks ago, a Mid-March snow storm of epic proportions is ready to strike. The conditions are just right for Winter Storm Stella to cause monstrous travel headaches this week throughout the Mid-Atlantic and New England. The major metropolitan areas of Washington D.C., Philadelphia, New York City and Boston are preparing for what could be a historic storm. Snowfall accumulation will vary by location. The Mid-Atlantic Coast will see the least amount of snowfall with just a couple of inches. However, they should be prepared for coastal flooding. On the other end of the scale, the lower Hudson Valley, northern New Jersey and interior New England will see more than 18 inches. For the first time in a long time, these areas are under blizzard warnings. This is because high winds could drop visibility near zero. Once the winds pick up, power outages are a possibility for much of the Northeast. New York Public Schools already announced they will not be opening on Tuesday, March 14th. NOAA is stressing Nor’easter safety with good reasons. Blizzards can be very dangerous, even during cleanup. 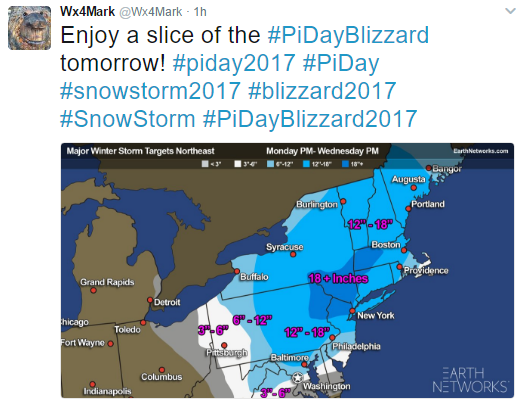 What some are referring to as the “Pi Day Blizzard” is already coming together. Today, 1 in 3 Americans are under a weather alert of some sort, according to CNN. All signs continue to point toward a significant snowstorm taking shape off the South Carolina coast this evening. After it begins, the storm will move up the Eastern Seaboard in classic Nor’easter fashion. The storm will cause snow across Virginia later Monday afternoon and up across Maryland after sunset. Snow will begin to rapidly accumulate in the Mid-Atlantic after 9-10 pm Monday evening. The snow could fall at a rate of 1-2 inches per hour. In Washington D.C. and Baltimore, the snow could turn to sleet or rain for a time. By late Monday night or early Tuesday morning, the snow may develop as far north as New York City. Travel should be avoided on Monday night in all the mentioned areas. The storm really gets cranking overnight. Snow rates are expected to exceed an inch per hour in the early morning hours of Tuesday. As the day breaks, heavy snow and strong wind will create near-blizzard conditions in parts of the Northeast. In some areas, snowfall rates could match 4 inches per hour. As the day breaks, heavy snow and strong wind will create near-blizzard conditions in parts of the Northeast. Wind gusts of 40-5o mph will surely halt airport traffic and some roads will become impassable. 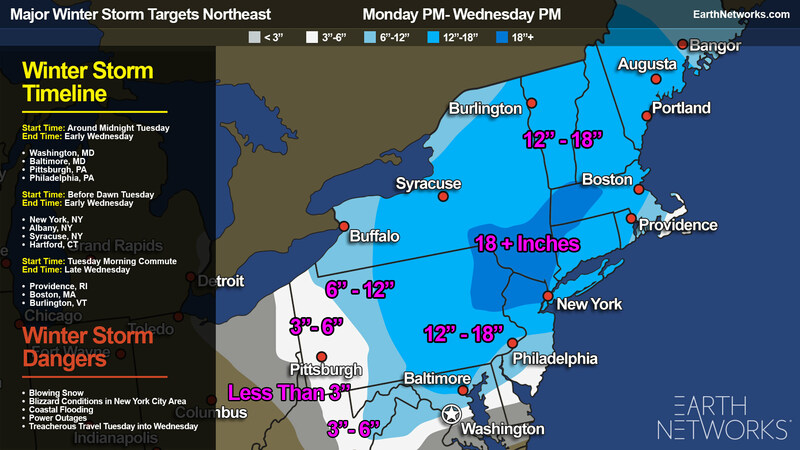 Snowfall amounts of 8-12+ inches by Tuesday evening will be common for much of the Northeast Corridor. This is especially likely in those areas north and west of I-95 from D.C. to New York and across most of New England. Snow will continue to fall Tuesday night in New England. To the South, snow will become lighter but gusty winds will ensure blizzard conditions. Snowfall amounts in interior Pennsylvania, New York and over most of the new England will range from 12 to as much as 20+ by the time the snow winds down early Wednesday. Even though the snow will be winding down on the 15th, there will still be light snowfall and gusty winds in the Northeast. Cold temperatures will continue even into Thursday after Winter Storm Stella departs. That means icy conditions could create a problem for untreated roads and power lines. While our meteorologists are very certain of Stella’s path, they will be tracking the storm continuously throughout the next 48 hours. Tracking a storm this large is good not only for meteorologists but for business owners and government officials as well. 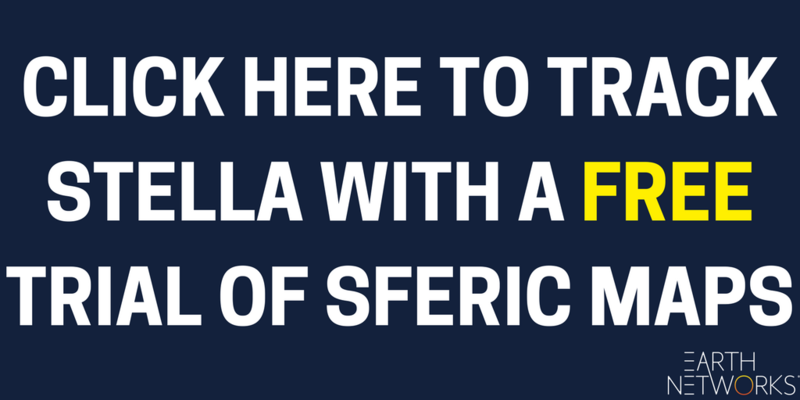 If you’re concerned about the effects Winter Storm Stella might have on your business, try out a free trial of our weather visualization tool Sferic Maps. Check back tomorrow for updates on the storm. 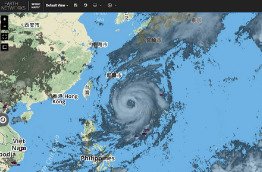 As long as we have power, we’ll publish the biggest updates and safety information on our blog. Stay informed by subscribing to our blog on the right-hand side of this page. As the late season Nor’easter makes its way up the Atlantic Seaboard, the risk of snow, sleet, coastal flooding and power-outage-causing wind gusts are likely. Snow continues to fall deep into New England, the central Appalachians and the Mid-Atlantic. The system will continue to move across eastern Long Island and New England this afternoon. Along with snow, this storm is bringing a wide range of wintry weather. Rain and sleet are common along the coast and south and east of Interstate 95. Along the I-95 corridor, periods of sleet coat the snow on the ground. Accompanying the participation, our weather stations have measured high winds along the coast over 50 mph in some areas. These winds could produce white-out conditions and knock hour power during the evening hours.